It appears a manufacturing flaw could hamper the devices’ ability to detect smoke. 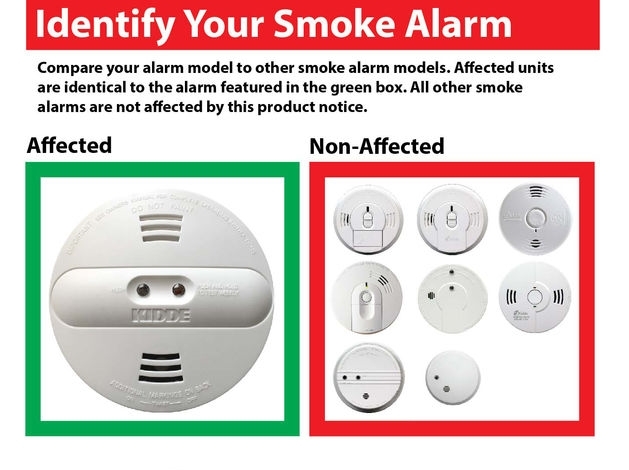 What’s the recall: This recall includes Kidde dual-sensor smoke detectors (models PI2010/PI9010). The Current risk: Yellow cap left on during the manufacturing of detectors can cover one of the sensors and compromise the detector’s ability to detect smoke, posing a risk that consumers may not hear the alert. Risk of Incidents/injuries: Kidde has received one report of the yellow protective cap being present on a smoke detector before it was installed. No reports so far of incidents or injuries as a result of the cap being present have been reported as of today. When/Where sold: Menards, Home Depot, Walmart, and other homes, and hardware stores nationwide, and online at Amazon.com, ShopKidde.com, and other national websites from September 2016 through January 2018, for $20 to $40. The fix: The recall notice by CPSC says consumers should remove a recalled detector from the wall/ceiling and visually inspect it through the opening on the side of the alarm for the presence of a yellow cap. Don’t attempt to take apart the alarm, open the casing, or otherwise remove the yellow cap. Follow manufacturer’s guidelines for changing batteries. We suggest getting dual detectors that also detect Carbon Monoxide. When changing batteries, we suggest vacuuming the vext out to make sure no debris can limit detectors ability to monitor the air. If an alarm has ever gone off, we suggest setting it outside for 12-24 hours to clean the sensor to clean air. Some manufacturers have this instruction as well. Here is a link to visual infographic from Kidde to view additional information.